14.11.2018: On 13 October 2018 Urs Huber from Switzerland set a new record in the 24-year history of the Crocodile Trophy when he claimed his fifth overall victory in Port Douglas after eight days and 27:38:30,7 of racing. On 13 October 2018 Urs Huber from Switzerland set a new record in the 24-year history of the Crocodile Trophy when he claimed his fifth overall victory in Port Douglas after eight days and 27:38:30,7 of racing. Fellow Swiss racer Konny Looser was his deserved runner up who took out the points classification. In third is the was Soren Nissen for Luxembourg ahead of the Austrian Matthias Grick and the Czech rider Milan Damek. The Cairns racer Sarah White claimed her second Crocodile Trophy win in the women’s classification with 36:10:25,6 ahead of Lucy Coldwell (AUS) and Sjoukje Dufoer (BEL). Once again the Crocodile Trophy journey started in the holiday paradise of Cairns, in Australia’s Tropical North-East in Queensland. Surrounded by rainforests, beaches and as the gateway to the Great Barrier Reef this picturesque holiday metropolis offers the perfect surrounds for race participants from all over the World to get ready for a unique adventure together with local riders. The Crocodile Trophy is the most legendary mountain bike stage race on Earth and this year took racers from 16 different nationalities including 18 Australians on a spectacular eight-day stage plan through Tropical North Queensland with almost 700 km and more than 15,000 meters of elevation. 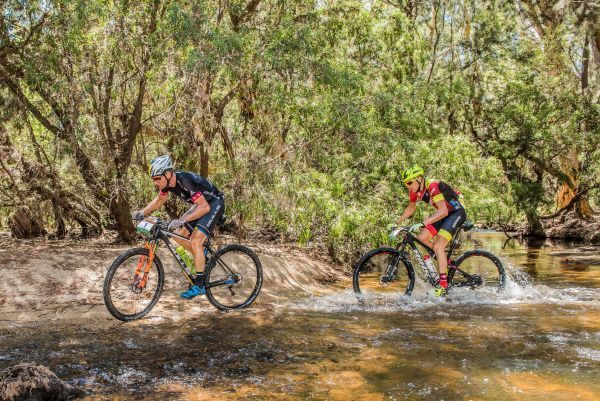 The action kicked off with a marathon from Cairns to Lake Tinaroo and day two and three they spent in Herberton and the surrounding Herberton Range National Parks. For the 16th time the Crocodile Trophy made a stopover in Irvinebank before heading North to Skybury Coffee for two nights. 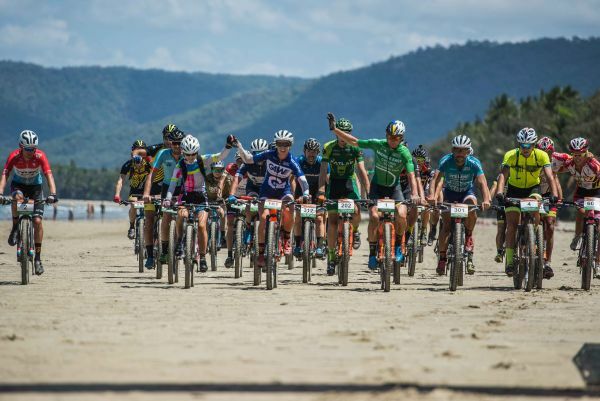 Wetherby Station hosted the event yesterday and today was a 50km race to Port Douglas, finishing with a fast descent down the escarpment towards the coast on the infamous Bump Track. Two riders stand out from the beginning this year: from day one the Swiss riders Urs Huber and Konny Looser didn’t leave anything out on track and set an incredibly high pace. Some of the top international elite riders tried very hard to keep up - the two Austrians Grick and Wetzelberger were working and chasing together at the beginning with Wetzelberger retiring with a knee injury at Skybury. Soren Nissen was often caught in between the duos and did claim a stage win, as did Matthias Grick. It ended up becoming a very tactical race for the chasers behind the inseparable Huber and Looser. After eight stages only one minute separated the Swiss elite racers and the remaining elite field had gaps of an hour and more. "I'm extremely happy about this victory and that I achieved what I set out to at the start of this race", said Urs Huber of his record-breaking fifth victory today. He explained that this was his sixth participation in 10 years and that a lot had changed in the event. "It used to be a road racers competition with long Outback highways and is now an event where you need to be an all-rounder, however, what is still the same is the fierce competition at the front end. You need to be a good technical rider, but know how to ride a tactical race too", he said and that he had gone up and succeeded against the likes of Olympic Champion Bart Brentjens from the Netherlands. This year had been tough as well with fellow Swiss racer Konny Looser a strong contender. "I went into this race fully focused, all that counted was the overall win", he explained his strategy, which got him the win by one minute overall. In the women’s Lucy Coldwell, the ex-road pro from Australia, handled her first Crocodile Trophy well. She had the women’s lead until day four when her fellow Australian and mountain bike endurance specialist Sarah White had the advantage on the technical terrain of the individual time trial stage. The Belgian road racer Sjoukje Dufoer also claimed two stage wins - two flat stages in the second half of the event suited her well. However, White’s lead was too solid and she won by more than half an hour ahead of Coldwell with Dufoer in third. Finishing in 13th place outright Sarah White said at the finish, "I really enjoyed this race, there was great competition among us women and a second Crocodile Trophy victory means a lot to me." Certainly, once again the Crocodile Trophy proofed that it is a unique event where within just a few kilometers the scenery and the weather conditions around you can change completely. With very challenging terrain and also the return to longer stage distances, this year’s weather conditions threw everything at the riders too. It is one of the biggest challenges and also draw cards of this event: riders take on this amazing adventure after months of preparation and embrace the challenges. Those can’t be faced without thorough planning and training and such an intensive lead up time is tough to be combined with a busy family and work life, especially for amateur and hobby riders competing. It is this absolute dedication that defines the racers. The Crocodile Trophy is an incredible logistical operation - while the racers are gunning through Tropcial North Queensland’s dense rainforests, the remote Outback and the so iconic Australian bush, an international crew packs up the camp and transports everything to the next destination. Track marking and feed zone teams go out on track in the early morning hours already along with medical crews and the media teams. One of the most fascinating elements is the kitchen and the unbelievable amounts of food which are cooked, served and eaten daily. An Austrian Chef manages the kitchen and looks after the nutritional needs of the riders. Incredible amounts of food are cooked, served and eaten here each day…. 180 eggs, 40kg meat or fisch, 25kg pasta and a lot of vegetables are prepared daily. The organisers make a point of sourcing everything locally - fresh produce from the Atherton Tablelands and at Skybury the riders enjoy the freshly roasted coffee as well as papayas and bananas straight from the farm. At Wetherby Station juicy steaks are on the menu for the final dinner under the stars. For the first time this year there was a mass arrival at the finish line. After the final kilometers of stage eight down the steep and technical Bump Track descent from the Escarpment down to Port Douglas, everyone waited together to honor a former Croc racer and mentor, Greg Parr. It’s an incredible feeling to become a Crocodile Trophy finisher - everyone starts with their own goals, Urs wanted to win five times others wanted the adventure. But all arrive together having shared a unique experience and with an amazing sense of achievement. The Crocodile Trophy will return with its 25th Anniversary Edition to Tropical North Queensland from 12 - 19th October 2019.